A pressing international challenge is developing processes of constitution-making that manage the politics of reform and produce legitimate and effective constitutions. This challenge is of special concern for numerous American Indian nations that have been embroiled in dual governments and constitutional crises over the past several decades. 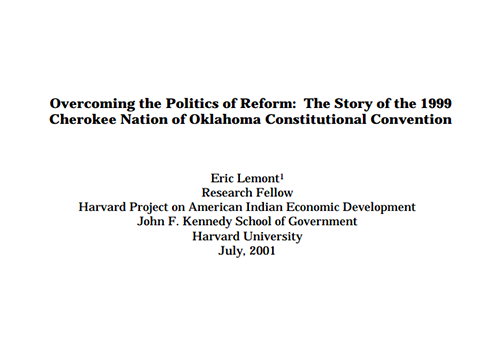 This article traces the recent constitutional reform process of the second largest Indian nation in the United States, the Cherokee Nation of Oklahoma. During the middle of its own constitutional crisis in 1999, the Nation formed an independent constitution commission and held a nine-day constitutional convention. The inclusiveness and independence of these two institutions —- combined with innovative strategies for achieving maximum citizen education and participation in the reform process —- provide a model for other nations interested in pursuing constitutional reform. In addition, convention debates over the boundaries of citizenship, patterns of political representation, and methods for achieving separation of powers reflect the substantive challenges faced by Indian nations as they have diversified and assumed greater governmental responsibilities over the past several decades.